Vancouver Canucks left wing Daniel Sedin (22) dumps Boston Bruins right wing Brett Connolly (14) during the third period of the Vancouver Canucks' 4-2 win over the Boston Bruins Thursday night at TD Garden in Boston. BOSTON — On the night when Daniel Sedin became the Vancouver Canucks’ all-time-leading goal-scorer, the classy left winger was happier about something else. “It’s more about the two points,” Sedin said after registering his 347th and 348th career goals in the third period to give the Canucks a penalty-free 4-2 victory over the Boston Bruins. The Canucks (20-17-11) started play Thursday just two points away from the second wild-card spot in the Western Conference. “We want to get into the playoffs … winning games is huge right now,” said Sedin, who played his second straight game without injured brother and linemate Henrik Sedin. Daniel Sedin, who had gone four games without a goal since tying Markus Naslund for the team record, snapped a 2-2 tie when he scored on a rebound 7:03 into the third period — and then scored into an empty net as the Canucks, playing a strong defensive game, made it 3-0-1 in the last four games of a six-game road trip, 3-1-1 overall on the eastern journey. “That was like most of my goals, 2 feet away. It was perfect,” Sedin said. The first goal was also his 20th goal of the season, giving him his 10th 20-goal season in the NHL. The winner, on the rebound of a shot by defenseman Christopher Tanev, capped an offensive spree in a defensive game as clean as it gets. The Canucks, who had given up 177 shots on goal in the first four games of the trip, made life fairly easy for backup goalie Jacob Markstrom, who faced 30 shots — many of them harmless. “I thought we played smart,” said Sedin, noting his team tried to stay out of the penalty box against the team that was No. 1 in the league on the power play. 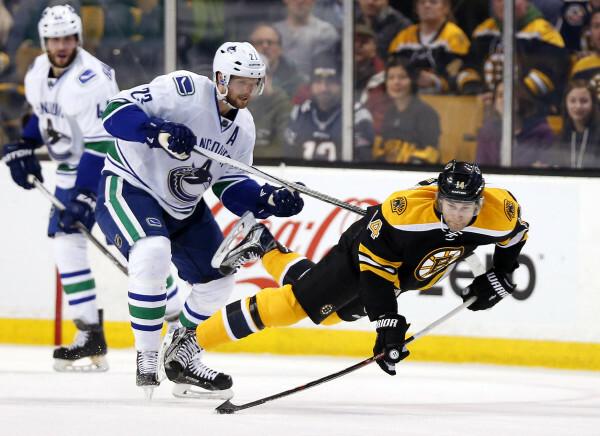 Up 1-0 on an early goal by left winger Sven Baertschi just 3:27 into the first period, the Canucks protected the lead until Boston right winger Jimmy Hayes glanced a shot off Tanev in the final minute of the second period. Right winger Alex Burrows put the Canucks ahead 1:49 into the third period. Burrows scored for the second straight game after going 24 games without a goal. Bruins left winger Brad Marchand tied it at 2 at 4:15 of the third period before Sedin’s game-winner less than three minutes later. Talking about Sedin, Burrows said, “Just amazing, the player that he is. Not only the goal-scorer that he is and he is able to … score timely goals, just his work ethic. The Bruins (24-17-5 but just 10-12-2 at home) pulled goaltender Tuukka Rask (23 saves but not sharp) with 2:05 left, but Markstrom (28 saves) didn’t have to make a save and Sedin scored from center ice with 22.1 seconds left. Boston’s three-game winning streak ended. NOTES: The Bruins hosted the family and friends of Denna Laing, the hockey player seriously injured in the women’s game at the Winter Classic. A pregame tribute included a video message from her hospital room and then her two sisters dropping the first puck. Boston Pride teammates sold 50/50 raffle tickets, as the Bruins and other teams rally on her behalf.